“This bottle of wine celebrates a grape that poses many challenges in the vineyard and in the cellar and keeps us humble” reads the back label of Pofadder 2014, the Swartland Cinsault in Eben Sadie’s Die Ouwingerdreeks (The Old Vine Series). Plenty of berry fruit (cherries, wild strawberries) plus some black olive, fynbos and earth. Light bodied with zippy acidity, the tannins however surprisingly firm. Very expressive but a definite rustic edge to it – the finish has a touch of blood about it. 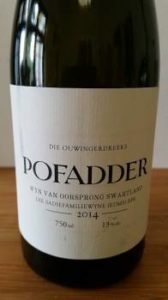 Approximate retail price: R225 a bottle.